Bill Merasty (Left), Bill Chippeway and Charlie Bittern participate in a friendship dance on the lands of the New Credit. New Credit First Nation, Canada Shouts of excitement accompanied 13-year-old Ryann LaForme on a Friday afternoon in June as she slowly proceeded with the 2015 Pan American Games torch, entering the grounds of the Mississaugas of New Credit for the first time. Flanked by a detail of police officers, the Ojibwe teen made her way through the crowd, pausing every few steps for photos. The upcoming Pan American Games, which will be co-hosted by Toronto and the Mississaugas of New Credit, a First Nations community more than an hour southwest of Toronto, are the largest multi-sport event ever to take place in Canada. 6,100 athletes from 41 countries throughout the Americas will compete in 36 different sports over the course of two weeks. With the games kicking off on July 10th, there is one important aspect missing: Aboriginal athletes. Despite a heavy push by organizers to highlight indigenous involvement, culture and history in the games, organizers know of only two Canadian Aboriginal athletes participating, Jamie Thiebault, a Métis volleyball player from Alberta, and Carlie Leigh Thomas, a Six Nations softball player. The fastest growing demographic in the country are First Nations youth, but their presence in high level sports competitions remains chronically low. Aboriginal athletic involvement continues to be a reflection of an ongoing struggle within communities across the country. The torch relay and spotlight on Aboriginal inclusion comes just a few weeks after the release of a scathing report by Canada’s Truth and Reconciliation Commission on the history of mistreatment suffered by First Nations students who went through the country’s infamous residential schools. More than 3,000 witnesses testified over a span of seven years on the constellation of abuses experienced at the schools from whippings to sexual misconduct and cultural destruction. Standing along the New Credit torch run with grins on their faces, Charlie Nelson, Bill Chippeway, Charlie Bittern and Bill Merasty watched LaForme carry the flame. The Ojibwe men, in their 60s and 70, trace their involvement in the Pan Am Games back to 1967 when Canada first hosted the international event. The four men’s torch relay almost 50 years ago has become a source of inspiration for First Nations communities across the country and an exemplar of how the legacy of residential schools continues to malignantly leach into today’s youth. In the summer of 1967, Winnipeg, Manitoba was host to the Pan American Games, a competition held every four years and the largest event to ever take place inside the quickly growing city. As the torch made its way from previous host city São Paulo up to Canada, the organizers selected ten Aboriginal runners to carry the flame in its final leg from St. Paul, Minnesota to Winnipeg. All but one, David Courchene, were drawn from residential schools in Manitoba. The flame arrived in Minneapolis, site of the US Pan Am trials, and the formal start to the journey began July 17th as the torch was lit on the steps of the Minnesota capitol. Over five days, the youth traced an old route used by Aboriginal runners to carry mail from the United States to Canada, covering 500 miles. Chaperoned by a Minnesota State Trooper, the lanky teenagers split their running into shifts of a mile each, treading along the highway towards Canada. “We ate like kings and slept in mansions,” recalls Bill Merasty in stark comparison to life in residential schools. Bill Chippeway, Bill Merasty, Charlie Nelson and Charlie Bittern, 48 years after the run. Their lineage produced heroes like Tom Longboat, an Onondaga from the Six Nations Reserve fittingly near New Credit. Nicknamed ‘Wildfire,’ he was an indomitable distance runner, winning the Boston Marathon in 1907 and earning himself the title ‘Professional Champion of the World’ the following year. But, throughout Canada’s sporting history, only one First Nations athlete has ever won an Olympic gold medal. In the 1984 Los Angeles Olympics, Alwyn Morris proudly held up an eagle feather after his victory in the sprint kayaking event. Subsequent Canadian Olympic teams, winter or summer, rarely have more than two or three First Nations athletes. Pan Am teams haven’t fared much better, with Waneek Horn-Miller, a Mohawk water polo player who won gold for Canada at the 1999 Pan Am Games and competed in the 2000 Sydney Olympics the most notable example. Charlie Bittern, a polio survivor, originally qualified for the Pan Am Games in the two-mile track race. Despite his win over university-aged athletes, he was told that instead of competing in the games, he would carry the torch as part of a relay team. Yet, the journey was also an escape from the harsh life of residential schools. “If you were doing something wrong, you were whipped. You weren't strapped- you were whipped. There's a difference,” says Bittern. The robust sports programs available to the student lessened the daily cruelties. Used to a life outdoors, both Bill Chippeway and Charlie Bittern have fond memories of sports year round, including basketball, hockey and track. But because of Bittern’s speed and endurance, he was used by the principal to chase down runaway students. The plan for their torch run, as the boys understood it, would have them carry the flame into the stadium, to be handed off to another runner. As they approached, the sky quickly darkened and a downpour of rain blanketed the city. Before they could enter the grounds to finish their run, officials stopped them and had Courchene hand over the torch to a non-Aboriginal athlete, who completed the final leg of the run, ascending the steps towards the cauldron. At the time, none of the runners realized the snub at the end of their run was because they were Aboriginal. Instead, it seemed like a mistake borne of the frantic organization surrounding the event. “You know, when you're young, there's a lot of things you don't realize,” says Courchene. The boys, with the exception of Bittern, took in the opening ceremonies from the seats of a nearby pancake house, eyes on a television. Bittern was put back on a bus to his residential school shortly after the run was finished, and remembers seeing fireworks bursting overhead as he watched the city slowly fade away. Ontario Regional Chief Isidore Day (left) speaks with New Credit Chief Brian LaForme, Minister George Zimmer, Waneek Horn-Miller, Ron McLean and Bill Chippeway about the journey of the runners in 1967.
ln 1999, three years after the last residential had closed, Pan Am organizers reached out to the runners, then in their 50s. Winnipeg was hosting the games once more. 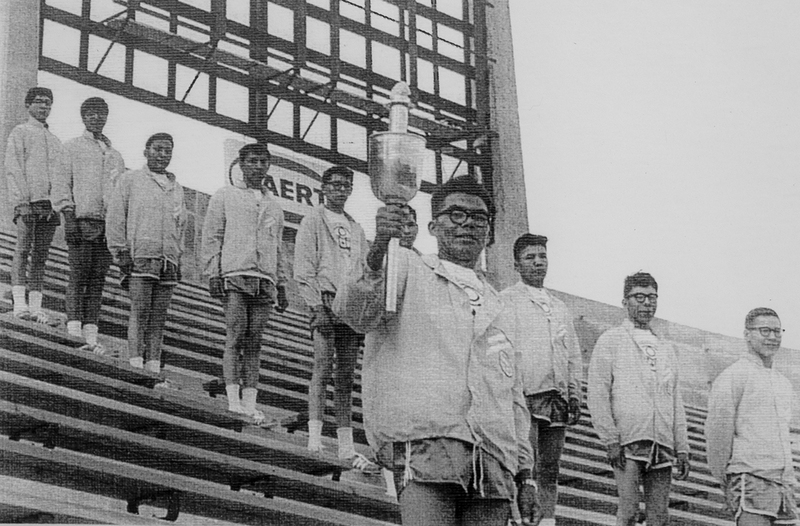 They were asked to lead the torch into the stadium- an attempt by the province and organizers to let the men finish their run and right a historical wrong. Courchene proudly carried the torch once more, as he had back in 1967. One condition the men had requested was that the torch then be handed to a young First Nations girl, transferring the flame to the next generation. “It felt within our own heart that the spirit of our ancestors celebrated that we had completed a significant part of the journey. But the story was not over,” says Courchene. With youth continuing to be a quickly growing demographic, the men set their sights on serving as role models, unwilling to fade back into anonymity. Ryann Laforme (centre) holds the Pan Am torch as during a celebration in New Credit. Charlie Bittern, Bill Chippeway, Charlie Nelson and Bill Merasty stand behind her. Runner Charlie Nelson (right) is greeted by New Credit Chief Brian LaForm during a celebratory event hosted by the community to welcome the torch. “I dropped out of school, I became a drunk,” says Chippeway, voice tight, sentences short. “Started boozing, started abusing drugs. I was a drug addict, an alcoholic. And I didn't know why this was happening to me, why I enjoyed booze so much. And when I used to be drunk, I used to cry. Because I used to think about what happened to me at Sandy Bay.” Running was an escape. “In the schools, we were like hostages.” He later embraced Cree culture in Alberta, a departure from his Ojibwe roots. He sought the help of elders to heal. He credits his years of sobriety and recovery tradition and community, along with the support of his wife. For the runners, experiences in residential schools are inextricably tied to the dire situation Aboriginal youth face. His experiences run parallel to many survivors of the school, including the permeating stress and shame that followed him for years after leaving the school. “Significant disparities exist between the social, economic and cultural opportunities available to Aboriginal peoples and to Canadians on the whole. This is reflected in higher rates of illness, premature mortality, school leaving, unemployment, poverty, and incarceration among Canada’s Aboriginal population,” says a report by the Canadian Center for Ethics in Sport. Organizers of the 2015 games are acutely aware of the failings to recruit and train a large number of Aboriginal athletes. “The government of Ontario has just announced that it’s invested 3 million dollars in an First Nations sports and wellness program that will in part address these gaps at the grassroots level,” says Kenn Ross, head of Aboriginal Relations for the 2015 Pan Am Games. The preliminary TRC report was released in June, 2015. Couched in a long list of recommendations, Chairman Murray Sinclair, an Ojibwe-Canadian judge, concluded that the actions of the state, in concert with religious institutions, amounted to cultural genocide. Stained by elevated suicide rates, addiction and mental health issues, and a vulnerable youth population, First Nations communities across the country continue to feel the effects of the schools. The release of the report only pushes the men harder to inspire and guide youth. It was sport that helped them during the schools, and they see it as one of the solutions for communities in crisis.